Sadie Delashmit ’14, of Bloomington, Ill., is the latest member of the Lowe family to walk through the front gates of McKendree. 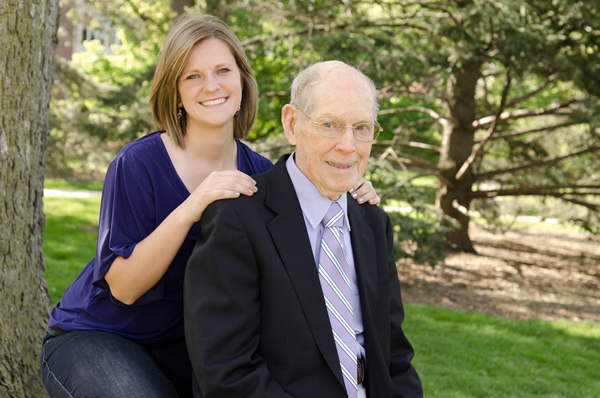 When looking at universities in 2010, Sadie never thought she’d end up at her grandfather’s alma mater. She had been offered a soccer scholarship at another university. But one visit made her reconsider. “I came to campus and fell in love with the school and the community,” Sadie recalls. Preaching comes naturally to Don. He comes from a long family line of Methodist ministers and was a former district superintendent of the Illinois Great Rivers Conference. He also served on the McKendree Board of Trustees for over 30 years and received an honorary doctorate in 1970. While a religion student at McKendree, Don was extremely involved on campus serving as president of the student body, president of the Student Christian Association, president of Philo, editor of the McKendree Review, member of the Ex-G.I. Club, Sigma Tau Delta, Student Faculty Council, and the basketball and track teams. Out of the classroom, Sadie is involved with Students Today, Alumni Tomorrow, the Center for Public Service, and the women’s soccer team.